As an assistant professor in the Institute of Gerontology and director of the university’s Assistive Robotics and Technology Lab, Jenay Beer conducts research at the intersection of social science and technology. I earned my Ph.D. and master’s degree in engineering psychology at the Georgia Institute of Technology. My bachelor’s degree in psychology is from the University of Dayton in Ohio. I am an assistant professor in the UGA Institute of Gerontology, and I hold a joint appointment in the College of Public Health and the School of Social Work. I also direct the university’s Assistive Robotics and Technology Laboratory. I arrived at UGA in August of 2017. Coming to UGA was a multifaceted decision: a perfect match of university, location and fit. I fell in love with Athens immediately, and it felt like home the day I interviewed. The Institute of Gerontology is an exciting place to work, with dedicated, passionate colleagues and an interdisciplinary approach to research, education and service. My favorite course is “Smart Technology in an Aging Society.” I offer this course through the Institute of Gerontology at the undergraduate and graduate levels. In this course, students examine how health and assistive technology is shaping our society. Our society is aging as the proportion of older adults in our population increases. Smart technology, such as health care devices, smart homes and robotics, will increasingly become integrated into our everyday lives, and older adults in particular could benefit from such devices. We examine how technology can be designed to be user-friendly for older adults, as well as the ethical considerations for implementing smart technology in our homes and in health care. The most exciting aspect of starting my career here at UGA is the nature of my position. In addition to being a faculty member in the Institute of Gerontology, I hold a joint position in the College of Public Health and the School of Social Work. Holding a joint position highlights the interdisciplinary nature of my research. My position at UGA breaks down silos. 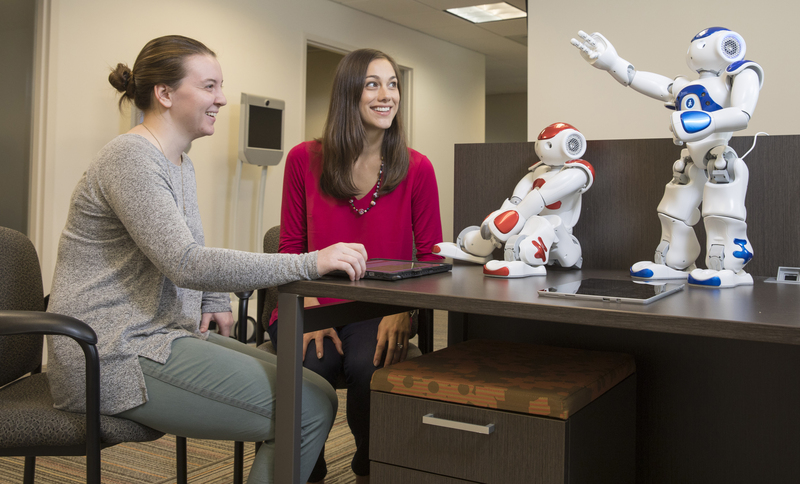 The Assistive Robotics and Technology Lab is made up of students from many educational backgrounds who are collaboratively tackling tough research questions. I am honored to work with an exceptionally talented group of young individuals; I learn from, with, and for my students. My research program is an unusual mix of social science and technology! I leverage this unique interdisciplinary approach to investigate technology applications that promote health and well-being for older adults. Our ever-growing older population is living in a world where technological advances in computers, smart homes and robotics are shaping health care management, aging-in-place and access to cutting-edge interventions. The majority of my research falls under a field called “Human-Robot Interaction,” or HRI. Developing assistive robots has proven to be a difficult challenge. For assistive robots to have their desired effect, they must be usable, accepted and readily adopted by the older population. As robots become more advanced, how should they interact and communicate with us? More specifically, how should robots interact and communicate with older people, including those with cognitive decline, physical impairments and a loss of vision or hearing? What about their caregivers? Furthermore, there is a critical need to understand how technology and robotic interventions fit within our efforts to promote health in older adult communities, as well as inform our understanding of aging. The success of assistive robots hinges on better understanding these complex, multifaceted dynamics and incorporating them into the design process. HRI focuses on just that—how to design, evaluate and implement robots for human use; or in other words, how to put the human into the engineering equation. The goal of HRI is to develop technology that is useful, usable and integrates seamlessly into our daily lives. Accomplishing this requires collaboration between multiple disciplines—specifically, the social sciences, engineering and computer science. Advances in robotic technology continue, improving capabilities around autonomy, intelligence, learning and mobility. As the technology improves, robots become more and more useful, the possibilities for applications increase and the need for HRI as a field of study grows with it. I believe research and education go hand-in-hand. “We are all aging,” is my typical opening statement on the first day of class. I propose this statement to serve as a significant opening to challenge students to think beyond their comfort level (what 20-something-year-old wants to think about growing old? ), discipline (my students have ranged from social scientists to engineers) and knowledge base (what is aging, anyway?). As an interdisciplinary instructor, my teaching philosophy is to provide a stimulating classroom environment with core values that, I believe, help develop students into community-engaged professionals—no matter their discipline or career path (aging, technology or otherwise). I hope students gain the confidence and inspiration to ask outside-the-box questions. When I was an undergraduate, never in my wildest dreams I imagined that I would research robots and aging, but I found a way to combine my love of technology, aging and research. I tell my students to let their passions guide them, ask interesting questions and arm themselves with the scientific skillset to answer those questions. That will guide them in any career they choose. My most inspirational students demonstrate intellectual curiosity and passion. Harness those two qualities, and that student will go far. I have the unique benefit of having multiple offices on campus! My primary office is on the Health Sciences Campus in Hudson Hall. I like to take walks on HSC … but let’s face it, I typically find myself in Normaltown at Sips for a chai latte, or Ike and Jane’s for a donut. My office at the School of Social Work building is wonderfully situated near the North Oconee River. It is really beautiful. Spend time with my family—there are a lot of wonderful parks in Athens. I really enjoy cooking and baking—I am on a personal mission to make the perfect chocolate chip cookie. I also like to refinish furniture and travel. I am becoming increasingly involved in the UGA Gerontology club. This club organizes a variety of community events in the Athens area to promote healthy aging. I give presentations at the Osher Lifelong Learning Institute (OLLI@UGA), where courses are offered to persons aged 50+. Finally, I serve in mentorship/professional roles that promote women in STEM. My favorite movies are definitely the original “Star Wars” trilogy. As a child I fell in love with R2D2. Fast-forward several decades and, as a researcher, I remain in awe of how a fictional droid can capture the hearts of millions by socially communicating with only “beeps and boops.” My love for “Star Wars” has definitely fueled my research endeavors. The warm welcome I received from my colleagues. We are a collaborative team, and I have truly made lasting friendships with my fellow UGA faculty.